Jack White took my phone and locked it in a bag. To be fair, it was actually Yondr, a company that specializes in phone-free experiences, like White's homecoming concert on Tuesday night at Nashville's Bridgestone Arena. But the no-technology, no-distractions edict was clearly the famously analog musician's idea. And a good one, it turns out. Over four-and-a-half hours, three distinct acts soundtracked a dark arena that, without the glow of mobile devices, was nearly impossible to date. White's set, guitar-heavy, up-tempo and anthemic, could have been mistaken for a Seventies rock show, while openers Margo Price and Joshua Hedley evoked the lo-fi strum and twang of country's golden era. With Price and Hedley both signed to White's Third Man Records label, the night had a decidedly family feel, as well as an air of triumph. Especially for Hedley, who made the dramatic leap across Broadway from honky-tonk singer in Robert's Western World to honky-tonk singer on an arena stage. The "Mr. Jukebox" crooner, whose big voice and super-sized band, complete with string section, filled the Bridgestone, had no intention of forsaking his roots, however. "See you at Robert's on Monday," he promised during a final bow. Price took the family vibe of the evening to heart - announcing onstage that she and husband Jeremy Ivey are expecting a baby in May. "I have been hiding something behind my guitar," she said, introducing the life story "Hands of Time" off her debut album Midwest Farmer's Daughter. With her band locked in tightly to the country-funk beat she's been cultivating, Price's performance was a stunner, touching on tracks from her debut and 2017's All American Made, as well as showcasing new songs, like the freight-train hustle of "Heartless Mind." She cut down sycophants in "Leftovers," celebrated her own resilience in "A Little Pain" and hit a money note in the Nashville-bashing "This Town Gets Around." But it was a solo reading of "All American Made" at the piano, with Ivey on harmonica, that packed the most punch, as Price cut through American hypocrisy with lyrics about crooked presidents and neglected immigrants. If Price and Hedley's sets were displays of controlled vocal prowess and country discipline, White's headlining performance was a master class in going off the rails. Upon taking the stage, he was banging out cacophonous notes on his guitar while staring down the superb drummer Carla Azar, whose cymbal White sent crashing to the ground before they even began the opening number "Over and Over and Over." He kicked, shuffled, shrieked and at one point fell down some stairs, guitar in hand, only to get back up and furiously attack his instrument. 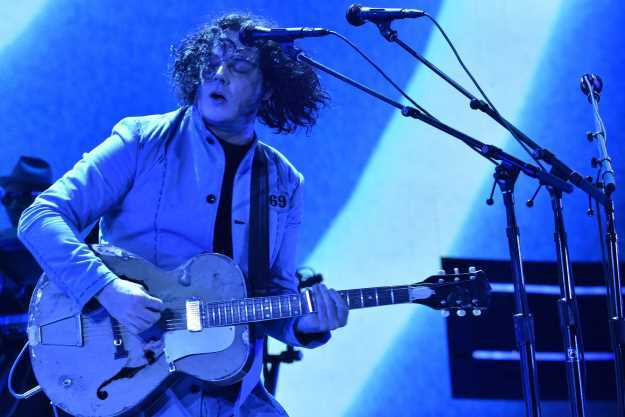 Over 25 songs, White played milestones from throughout his career, from White Stripes sing-alongs - like "Hotel Yorba" (reimagined as a rockabilly number) and "Hello Operator" - to entries with the Dead Weather ("I Cut Like a Buffalo") and the Raconteurs ("Steady, As She Goes"), whom White confirmed are recording new music. Another White Stripes song, "We're Going to Be Friends," off 2001's White Blood Cells, found White inhabiting the role of a Nashville Mr. Rogers, introducing himself to the crowd as their neighbor and friend. The gesture, warmly appreciated by the audience, further cemented the gig's familial vibe and White's role as a champion of Music City. Throughout his two-hour set, White pushed his voice as hard as his guitars, fully embracing a hoarse rasp when warranted, and encouraging his fans to handle a chorus here and there. By night's end, his pipes spent, he could barely offer his customary goodbye: "You've been incredible, and I've been Jack White." But that exhaustion - along with the intense focus of a phone-less audience - is what made White's wild performance, ostensibly a makeup for his rain-canceled set at September's Pilgrimage Festival, a true "moment." In the end, it stood as one of those Nashville concerts where - despite the arena being well below capacity - everyone will claim they were in attendance. And without the cellphone photo as proof, who's to say they weren't? 01. "Over and Over and Over"
10. "Dead Leaves and the Dirty Ground"
11. "We're Going to Be Friends"
12. "I Cut Like a Buffalo"
13. "Why Walk a Dog?" 14. "The Hardest Button to Button"
15. "Steady, As She Goes"
20. "The Same Boy You've Always Known"
22. "I'm Slowly Turning into You"